Discussion in 'Lexus Lounge' started by BigTuna, Mar 8, 2017. Hey everyone! A few days ago, I had the opportunity to capture a moment of history, the first production LC 500s being delivered to the East Coast, USA. All four cars were hybrids. Port of Newark | March 6, 2017 | 8:15 a.m.
Five years ago at the Detroit Auto Show, Akio Toyoda revealed his vision for a new Lexus, the LF-LC. This groundbreaking concept was so bold that many critics said it couldn’t be built. 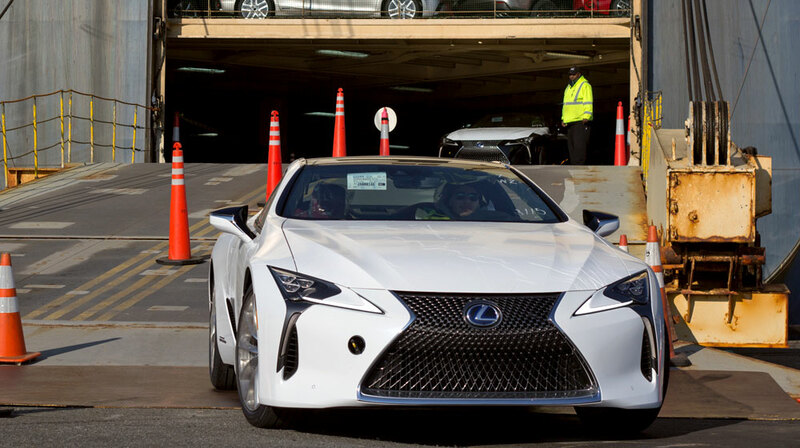 This morning at 8:15 a.m., four LC 500s made their grand arrival at the Port of Newark straight from the Motomatchi Plant. With their commanding stance and sleek contours, even the longshoremen found a need to pause and stare in awe. There was an undeniable feeling in the air that a new era for Lexus had begun. These four stunning vehicles proved that Lexus continues to defy the impossible. Safe to say, the critics were wrong. TripleL, mikeavelli, Trexus and 9 others like this. What an awesome moment. Thanks for sharing! mikeavelli, IS-SV, Ian Schmidt and 1 other person like this. All four models were LC 500h models. mikeavelli, Trexus and Den like this. awesome! I'm sure they went right to the Eastern Area Office? Or LEXUS OF ROUTE 10! Thanks for the great pics. What's that black round thing on the right of the front bumper? It was never in any of the previous pictures/videos of the LC. This is an access port used to secure the car for transportation. After the car reaches its destination, an insert covers the port. krew, mikeavelli, ydooby and 1 other person like this. These are great pictures! thanks for posting them. I just joined Lexus Enthusiast and this is the kind of news / info that I am looking for. BTW: I know that my local Lexus dealer in Indianapolis (Tom Wood Lexus) is getting their first LC 500h on March 30th (to be initially used as a show room model). They are getting the first cars that were ordered in May. I am anxiously waiting for the arrival of my LC (sport performance package) in May. The dealer has invited me to test drive their new showroom LC 500h on March 30th and I can't wait! oem_is300, krew, Brooks2IS and 7 others like this. Awesome I wish we could get the same opportunity in my country to take photos of the LC500 arriving at from the docks. Though we have exchanged private messages, on behalf of the community I welcome you! Brooks2IS and mikeavelli like this. Are these really production builds and not just late stage pilot production? Production would start in March they said, but looking at the date this was posted, it seems way too quick have them roll out series production models from Motomachi and have them in the U.S. that quickly. For that to happen, production began in February at least and definitely not in March. Joaquin Ruhi, RAL and mikeavelli like this. I think these are the 4 production cars being used for training. From my understanding hybrids will be easier to get before the V-8. Trexus, Joaquin Ruhi, Carmaker1 and 1 other person like this. These four LCs were built in 1/17. Joaquin Ruhi, Carmaker1 and krew like this. Joaquin Ruhi, Carmaker1, krew and 2 others like this. Would just like to say I saw an LC driving around today it was unbelievable. I wanted to turn around and follow it but couldn't get across the road! So excited to start seeing these all over the place! meth.ix, krew and PeterF like this. zeusus, Benito, Joaquin Ruhi and 6 others like this. I'm sure you'll show us pics when you get it but may I ask what color and trim you got?! RAL and PeterF like this. infrared with tan/brown interior: sport performance trim (the top trim, everything, carbon roof etc). I decided since I was spending so much money I was not going to go for a mid range trim and then wish I got the top trim. Joaquin Ruhi, meth.ix, RAL and 1 other person like this. Sounds sweet! I'm with you IF I could afford it go all the way baby! lol congrats look forward to seeing pics! Joaquin Ruhi, meth.ix, Brooks2IS and 3 others like this.